Lucknow can be said to be the educational capital of Uttar Pradesh as the city boasts of some very good schools, colleges and research institutes. The city houses many educational places that can help visitors explore the secrets of nature in the learning background of the city. Lucknow has secured a place among some of the best Indian cities with the variety of educational institutions, research avenues, art prospects, and multiple vistas in dramatics. The following listing will provide you with information about some of the educational and research organizations in Lucknow that serve as centres for learning as well as venues for fun-filled family outings. The National Botanical Gardens is a lush green park with serene natural beauty to sooth your eyes and senses. It came into existence in 1800 when Nawab Saadat Ali Khan established it as the Royal Garden. Later on, Nawab Wajid Ali Shah got it developed further and named it “Sikander Bagh” after his Queen’s name, Sikander Mahal Begum. In the year 1953, it was taken over by the Council of Scientific and Industrial Research popularly known as CSIR, New Delhi. The garden serves as a public park for the local people and tourists. It is a huge botanical garden spread over an area of approximately 25 hectares. It houses varied variety of plants, aromatic plants, shrubs, trees, flowers, herbs and shrubs of economic and medicinal value including some rare and endangered species. It is a preferred spot for morning and evening joggers and also serves as an abode for nature, plants and photography enthusiasts. During the winter season, when seasonal flowers are in full bloom, Flower Shows are held in the Botanical Gardens. These annual shows exhibit attractive displays and formations of flowers such as Gladiolus, Rose, Dahlia and Chrysanthemum and attract massive crowds that include plant lovers, nature buffs, local people and tourists. The park is full of greenery that attracts Lucknowites and tourists alike, being a place full of natural scenic beauty to sooth senses. So, visit the gardens and treat yourself to nature’s delight. Another interesting place that pairs fun with learning is the Indira Gandhi Planetarium that helps to explore the hidden secrets of the celestial formations. 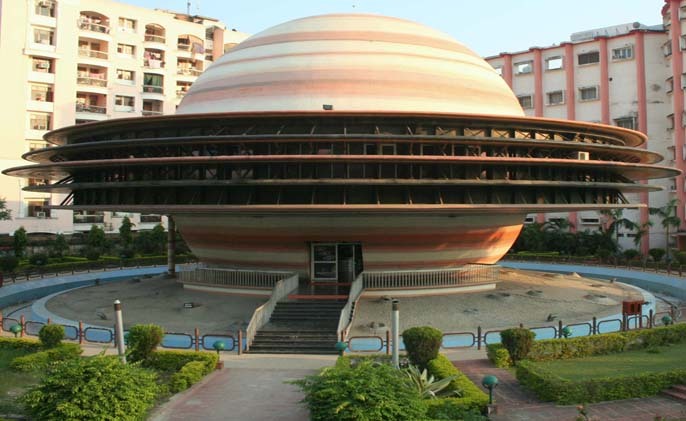 The foundation of the planetarium was laid in the year 1998, and it got inaugurated by the then Chief Minister of Uttar Pradesh opening it for the public. The structure of the building is in itself very unique and attractive. It is given the shape of the cosmic body “Saturn” with its typical and exclusive five rings. The structure which is 21 meter diameter sphere-shaped rests on a platform, which is designed to look similar to the formation of crater on cosmic bodies. The building is extremely eye-catching and unique to attract attention. The planetarium is situated on the banks of river Gomti and has a water pool with fountains to make the landscape look more beautiful. The planetarium screens shows of 34 to 45 minutes duration, which take you through the mysterious and astonishing world of astronomy. The planetarium will take you on a virtual tour of the galaxy of stars, where you can touch them, though only virtually. The shows feature various astronomic events in just a few minutes, whereas in reality these events take months, years or decades to occur. There is a very nominal fee for the shows but the planetarium remains closed for the public on Mondays. Look forward to the exploration of the enigmatic astronomic world of God on your next visit to the city. Another venue that promises knowledge and entertainment together is the Uttar Pradesh State Museum situated in the Lucknow Zoo (Banarsi Bagh) since 1963. It will take you to the rich past of the city and surrounding areas. The collection here comprises of Awadhi artefacts that depict its culture, customs and mythology followed in the past along with contemporary objects. It has a collection of terracotta, sculptures, copper hoards, thank as, scroll paintings, manuscripts, bidri ware, coins, ivory, metal ware, bronze images, wood work, textiles, miniatures, pre-historic tools, crafts, natural history specimens and many more relics of the ancient times. It also houses relics of the nearby areas and unearthed antiquities of the place where Lord Buddha grew up. The major highlight of the museum is an Egyptian Mummy (1000 BC), and many other objects of great worth and value. The State museum will delight and educate you with its rich collection of ancient objects and will take you through the times of the bygone era. Developed by the National Council Science of Museums (NCSM), the Regional Science City is another destination that offers a unique learning experience to visitors. The Science city aims to promote awareness about science and nature through interactive and fun-filled models and activities. It aims to educate the visitors on various aspects of science and nature laced with enjoyment and fun to make the scientific learning more appealing and interesting. It houses a SCIMAX theatre, a 220 seated auditorium showing documentaries projected on a hemispherical dome with a fish eye lens giving a very unique experience to the viewers. The Science city also houses four galleries showing exhibits explaining the different scientific concepts through easily understandable demonstrations. It also has a huge lush green Science and Prehistoric Park that allows sightseeing of displays on Physical Science, in the park. It is a beautiful place with various intriguing things on Science to learn with fun.